You cannot imagine a demesne, where you can do without computers these days. But what can you do, if the environment conditions are far from tender? What if you need a computer on a race route or geological expedition rather than on an office desktop? 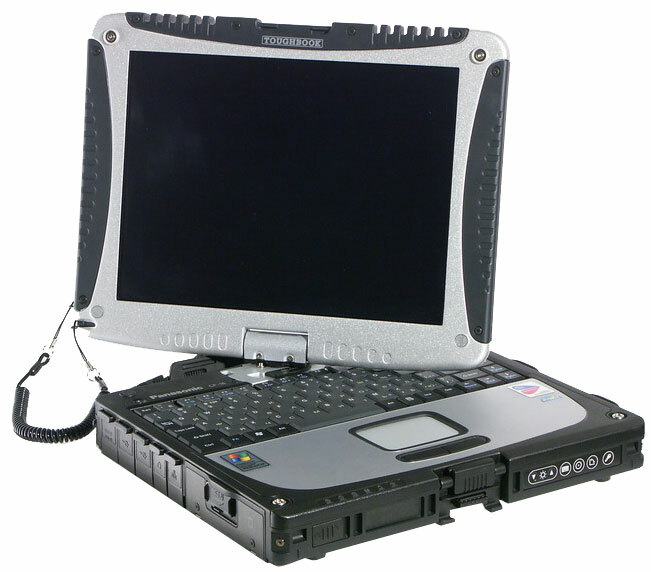 Toughbook CF-18 is designed for extreme environment conditions. 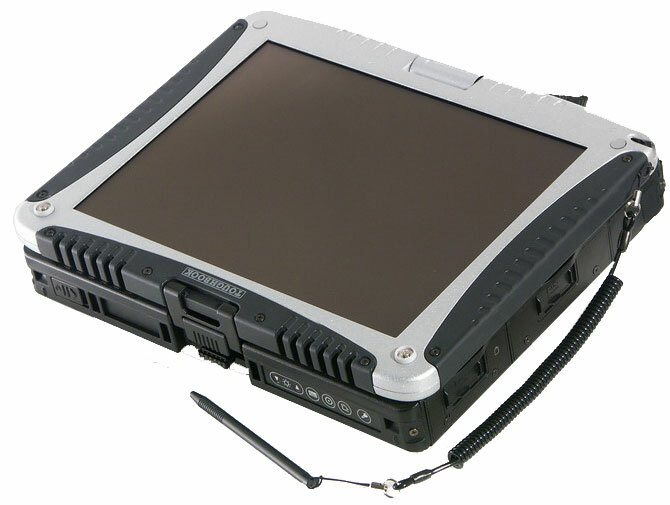 Besides, it's not just a notebook, it can transform into a Tablet PC. Let's have a look at the specifications. 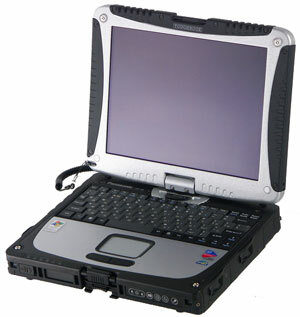 It should be noted that this model currently comes equipped with Pentium M ULV 713 1.1 GHz with Intel PRO/Wireless 2200BG. 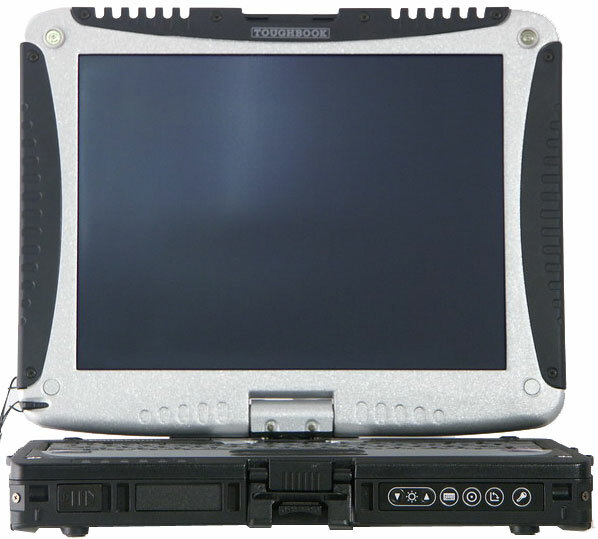 The model comes in two modifications - Touchscreen PC version and with a regular Tablet PC display with an electromagnetic stylus. In my subjective opinion, Touchscreen is better for extreme environmental conditions - at least you can manipulate it with your finger. We've tested this very modification. Exterior of the model is impressive. Full magnesium alloy case painted black, silvery lid with plastic rubber-like profiles. All connectors are covered with plastic caps. It has a wide fabric strap to carry the tablet PC. So, it does not go with a business suit. The metallic latch resembles packages with military equipment, but it is rugged. There are three covers at the rear. A group of audio jacks is located under the left one. A video out and a serial port are on the photo on the right. Kensington lock hole is in the middle. The front panel houses: power slider (on the left), display lid latch, and control buttons: brightness control and tablet mode buttons. These buttons will be described in detail below. 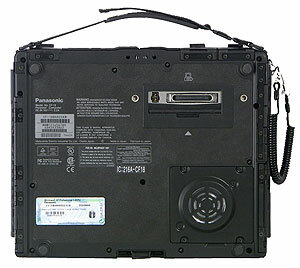 The power-on slider is a proprietary solution from Panasonic, it is also used in CF-Y2. This solution is justified for a rugged notebook, but it will take time to get used to it. From the usability point of view, we have some gripes with the USB layout (like in the CF-Y2) — this model offers two ports behind RJ-45 and RJ-11. 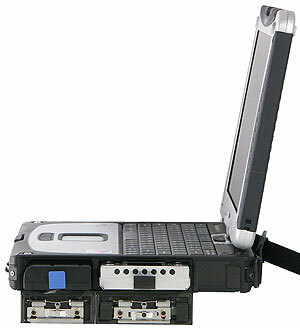 If a network or modem cable is plugged to the notebook, it's very inconvenient to connect USB devices. 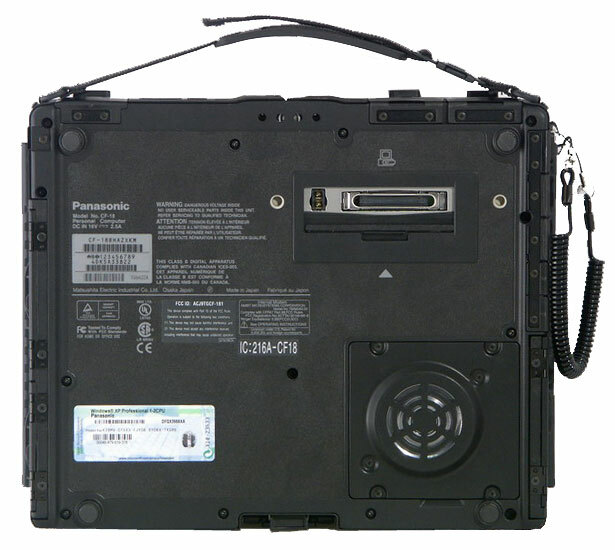 On the other hand, which is again typical of Panasonic, the layout of ports and the construction of covers allows to connect even large USB devices without adapters. The battery and HDD bays are on the right. 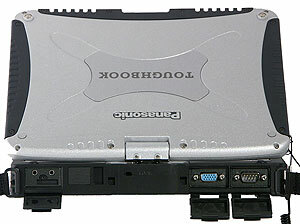 The HDD bay is filled with special gel that cushions shocks and vibrations. This notebook is designed in compliance with MIL STD 810F requirements (you can read about this standard here), it must endure 90 cm falls. It allows to quickly replace a HDD in case you drop it from a higher place :). It's not a vent grid, but a speaker on the bottom. The memory bay is below it. 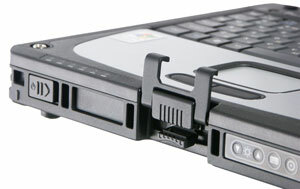 A docking connector is covered by a sliding lid. On the whole, this set of ports is sufficient for working under extreme conditions. They could have added IEEE 1394 though. We haven't tested it for protection. But judging from its construction, this notebook is protected from dust, dirt, and splashes of water, but it's NOT HERMETICALLY SEALED. So you shouldn't drop it into water, leave it in snow. Besides, you should be careful when working under heavy rain. So, let's open the device. The latch mechanism is intuitive, so you'll have no problems with it. At first, let's work with the CF-18 as with a regular notebook. Of course, the keyboard is narrow, which mostly affects the cursor keys. These buttons are in the inverted L form, instead of usual T-formation. It's unusual and not very convenient, to be frank. A very little Enter is also inconvenient. But on the other hand, Ins and Del are located rather conveniently as well as the only Ctrl. On the whole, you can work with that, but it might have been better. We have no gripes with the touchpad. 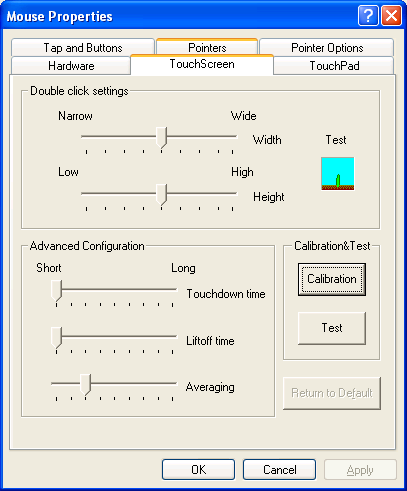 There are no scroll buttons, the edge of the touchpad is used for this purpose. 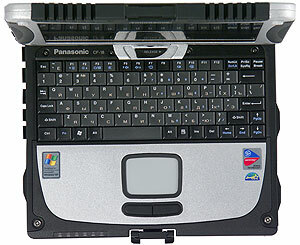 The group of indicators is located on the front of the notebook under the left palm, which may block it when you work. It contains (from left to right) indicators for Locks, HDD activity, battery charge, and notebook status. emulate Enter presses, and Log-off (there is an option, when you will have to enter a password to proceed). All in all, it's a standard set of functions for a Tablet PC. 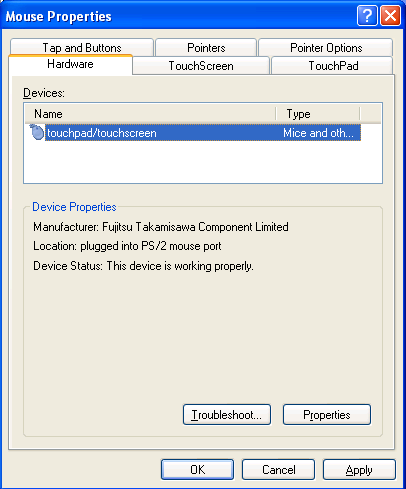 The touch screen, manufactured by Fujitsu Takamisawa, is rather convenient to work with - one of the reasons is a well thought-out system of settings and calibration. I managed to configure it for the bundled stylus as well as for my finger. Unfortunately, these settings are different. 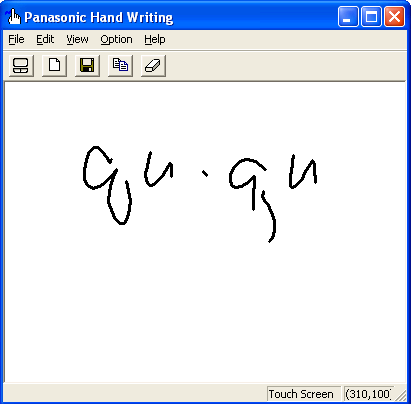 Of course, the software bundle includes a utility for creating hand-written notes. What concerns display characteristics, unfortunately we didn't carry out our instrumental analysis - our hardware complex was only in development at the time of our tests. 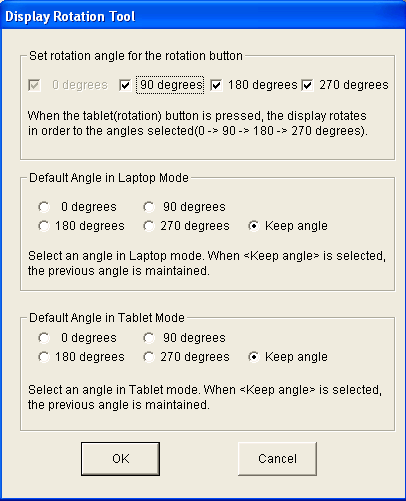 Viewing angles are subjectively not very good, which is only natural. But the contrast is rather good at the normal to the display surface. Drawing a bottom line, the notebook is not devoid of drawbacks. 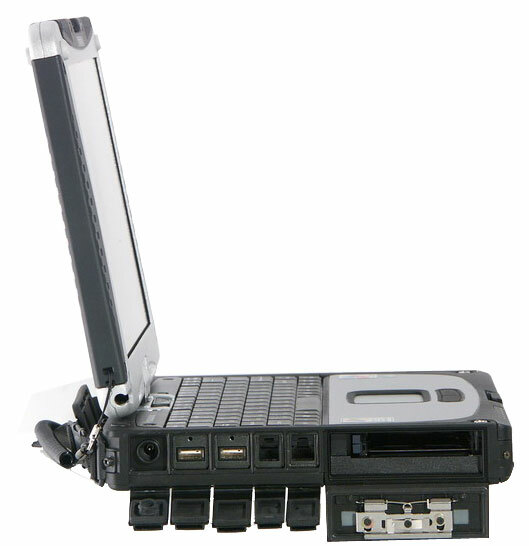 While the moderate set of ports is not a drawback and an industrial RS-232 port is an advantage, an inconvenient keyboard hardly has to do with the rugged construction. But if you want to work under environment conditions too rough for regular notebooks, you may lump the drawbacks. Performance of this model is sacrificed to its rugged construction - it's problematic to provide good heat removal in a dust- and water-proof case. That's why there is no point in publishing the results, especially as the only topical test (MobileMark 2002) refused to start up on Toughbook CF-18. 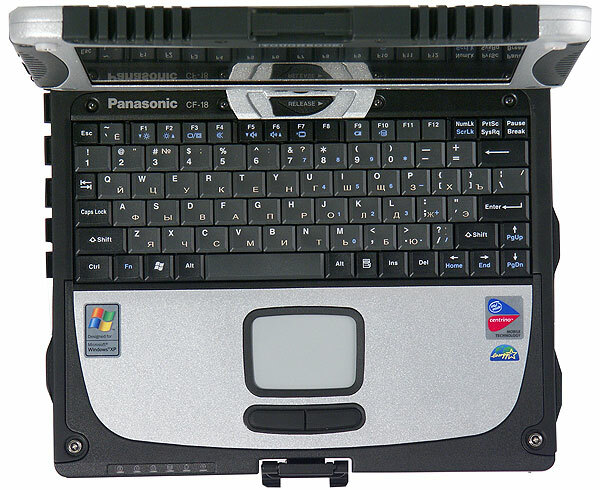 Panasonic Toughbook CF-18 possesses an aggressive design and high protection from unfavorable environment conditions. 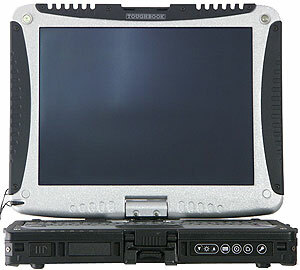 Another advantage of this model is its transformation into a tablet. Its disadvantages include a poor keyboard, and probably its price.